Can you imagine camping atop some of the highest mountains in Europe and waking up to a view of snowcapped peaks, deep valleys and endless blue skies? This paints an idyllic picture; field work definitely takes Earth scientists to some of the most beautiful corners of the planet. But, there often are two sides to one story. Kaspar Merz and André Nuber, researchers at ETH Zurich, who took today’s featured image, no doubt appreciated the wondrous beauty of their surroundings, but also experienced the perils of carrying out research in remote locations first hand. Be prepared to learn about some very interesting geoscience as well as reading about a true fieldwork adventure! In this picture our basecamp on the Furggwanghorn rock glacier is shown, home to four researchers (Marco Bonamore, Dominik Zbinden and the authors) for almost a week in early spring 2012. From here we conducted geophysical measurements, trying to reveal the internal structure of the permafrost body below our feet. Located in the Swiss Alps at an altitude of around 2700 masl, this rock glacier lies at the lower limit of the permafrost in the Alps and is therefore highly affected by increasing mean annual surface temperatures. It shows movement rates of up to 4 m/yr and deep crevices open as a result of this deformation. Researchers from the fields of geophysics, hydrology and geotechnical engineering made an interdisciplinary effort to understand the mechanical principles that govern the behavior of warming, degrading rock glaciers. This knowledge is essential for assessing risks associated with thawing permafrost, like rock fall, landslides and other instabilities. 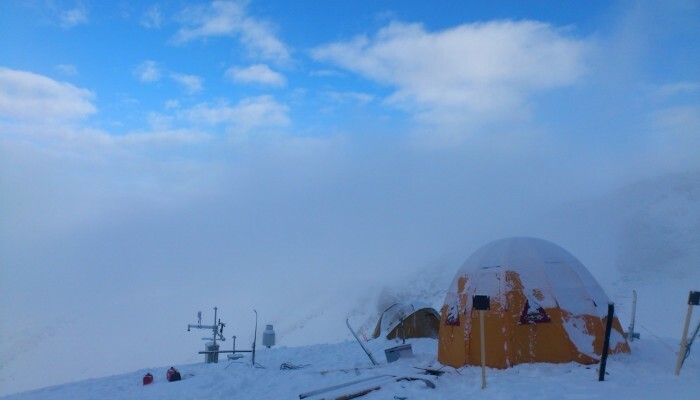 Field camp for geophysical investigations of permafrost at the Furggwanghorn rock glacier. Credit: André Nuber. With our geophysical measurements we were able to describe the internal structure of the Furggwanghorn rock glacier in great detail. The most fascinating discovery was a shear zone located at around 20m depth below the surface, where almost all of the deformation takes place. This finding was confirmed by inclinometer measurements in boreholes, and lead to a novel rock glacier model. Based on thin-skin tectonics, this model explains the formation of different generations of rock glacier lobes and it can be used as a basis for mechanical modelling of the entire permafrost body and its deformation. The field campaign got a bit more demanding than intended. Our plan was to stay for two days and one night but a sudden fog made it impossible for the helicopter to pick us up for return. 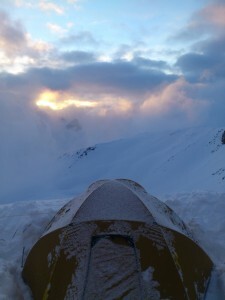 We decided to stay for one more night and ski down to the valley the next morning. But 50 cm of fresh snow did not only make our tent collapse, but it also severely increased the avalanche risk preventing us from skiing down. We therefore had no other choice but to stay until the helicopter could fly again, which was three days later! If you pre-register for the 2016 General Assembly (Vienna, 17 – 22 April), you can take part in our annual photo competition! From 1 February up until 1 March, every participant pre-registered for the General Assembly can submit up three original photos and one moving image related to the Earth, planetary, and space sciences in competition for free registration to next year’s General Assembly! These can include fantastic field photos, a stunning shot of your favourite thin section, what you’ve captured out on holiday or under the electron microscope – if it’s geoscientific, it fits the bill. Find out more about how to take part at http://imaggeo.egu.eu/photo-contest/information/. GeoTalk: How are clouds born?